NORTHWEST ARKANSAS — March 23, 2014 — On April 10, TheatreSquared will launch its first mainstage Shakespeare production with the playwright's signature drama, Hamlet, starring Grant Goodman. The production is helmed by director Sean Patrick Reilly and features a professional cast including T2 associate artistic director Amy Herzberg. As Hamlet begins, the king has been poisoned by his own brother, who now claims the throne and queen. Visited by his father's ghost, Prince Hamlet learns of his uncle's treachery — and vows revenge. TheatreSquared's original production is on stage from April 10 through May 4, 2014, at Walton Arts Center's Nadine Baum Studios in Fayetteville (505 W. Spring Street). Tickets range from $15-36 ($10/under 30) and are on sale now via the Walton Arts Center Box Office by calling (479.443.5600) or visiting theatre2.org. "Maybe you've heard of this one," said T2 Artistic Director Robert Ford. "At TheatreSquared, we love great plays — and every one of them is measured against Hamlet. Shakespeare's powerful drama mixes murder, gallows humor, intrigue, romance and revenge with the most extraordinary language ever written. In the 175-seat Studio Theatre, we're bringing Northwest Arkansas this epic story at its most intimate." The title role of Prince Hamlet is played by Grant Goodman, whose more than 50 Shakespeare appearances nationally include roles at Lincoln Center, The Old Globe, The Shakespeare Theatre Company (DC), Chicago Shakespeare Theater, Theatre for a New Audience, Shakespeare Theatre of New Jersey, Utah Shakespeare Festival, and many others. Goodman is joined by T2 Associate Artistic Director Amy Herzberg, Bryce Kemph, Kathy Logelin, James Odom, Courtneay Sanders, Jason Shipman, John T. Smith and Troy Schremmer. 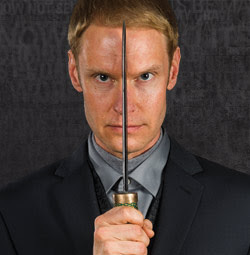 TheatreSquared's production of Hamlet is directed by Broadway veteran Sean Patrick Reilly, who previously directed Period of Adjustment and appeared in The Spiritualist and Good People for T2, and whose many professional credits include fourteen productions with the Royal Shakespeare Company. The creative team includes scenic designer Michael J. Riha, director of the design program at the University of Arkansas; lighting designer Shawn D. Irish, head of lighting design at UA; T2 resident costume designer Ruby Kemph; T2 resident sound designer Will Eubanks; properties designer Ashleigh Burns; stage manager Joseph Fletcher; technical director Josh Tillotson; assistant stage manager Emily Bohannan; and master electrician Sandra Bunch. Tickets are on sale now at the Walton Arts Center Box Office, and can be reserved by calling (479) 443-5600 or by visiting theatre2.org. Performances are scheduled Thursdays at 7:30pm, Fridays at 7:30pm, Saturdays at 2:00pm and 7:30pm, and Sundays at 2:00pm and 7:00pm. Tickets range from $15 to $36. A limited number of $10 tickets are also available for patrons under the age of 30 through the theatre’s “30 Under 30” program. The performance will run two hours and twenty minutes with one intermission and is recommended for ages 10 and up. TheatreSquared’s locally produced and nationally acclaimed productions reach 24,000 patrons each year. The company is Northwest Arkansas’s only year-round professional theatre, offering a unique audience experience in its intimate 175-seat theatre at Walton Arts Center’s Nadine Baum Studios. In 2011, TheatreSquared was recognized by the American Theatre Wing, founder of the Tony Awards, as one of the nation’s ten most promising emerging theatres. For further information, contact TheatreSquared at (479) 443-5600 or visit theatre2.org. TheatreSquared's production of Hamlet is sponsored in part by Malcolm and Ellen Hayward and by Susan and Orville Hall, in memory of Leo Van Scyoc.